Prajalpa – Why to avoid it ? I was sharing yet another mercy of Tulasi maharani at our home with ShyamSundar prabhu yesterday morning. While continuing our conversation over phone, as usual, our discussions went over from one topic to another and in the end we discussed how some devotees should have done such and such thing better and then the conversation ended. After ending our conversation I realised that from sharing a realisation and mercy I went into a judging mood about other devotees and that shows very poorly on my consciousness that even after reading and hearing so many instructions on this regard how easily I get into gossiping about devotees, prajapala. I immediately sent an SMS to ShyamSundar Prabhu requesting him to please stop me whenever I start discussing other devotee. In fact, I added that we should not even discuss other devotees behind their back. He heartily agreed. I felt much lighter. In the evening I was deleting old mails from my phone when I saw that in one of the mails was a seminar done by HG Radheshyam Prabhuji and Chaitanya Charan Prabhuji, Pune. The title of the topic, you guessed it – Prajalapa !! Godsend for me ! I heard the complete lecture on my way to and from office and it contained a wonderful learning for me. I am writing some part of it for the pleasure of devotees and I hope and pray to Srila Prabhupada that I too will learn something from this lecture. The seminar started with HG Radheshyam Prabhu’s lecture. Prabhuji started with giving a general view of what is prajalapa and what is not prajalpa. Jana sangha means association of non devotees. One’s devotional service is spoiled when he becomes too entangled in the following six activities: (1) eating more than necessary or collecting more funds than required; (2) over-endeavoring for mundane things that are very difficult to obtain; (3) talking unnecessarily about mundane subject matters; (4) practicing the scriptural rules and regulations only for the sake of following them and not for the sake of spiritual advancement, or rejecting the rules and regulations of the scriptures and working independently or whimsically; (5) associating with worldly-minded persons who are not interested in Kṛṣṇa consciousness; and (6) being greedy for mundane achievements. 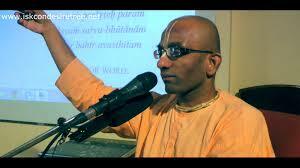 Prabhuji then explained how Srila Prabhupada and Srimad Bhagavtam use very strong words against prajalpa. Prabhuji then added that when a Jiva comes into this world he does jana sangha, the result is laulayam- Material greed. He then does prayaas, works very hard. For what purpose ? for atyahaara to collect more than what he needs. 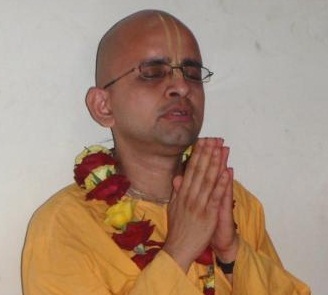 For doing prayaas in jana sangha he does prajalpa ! Prabhuji then explained that we have to use our intelligence to say that not everything minus Krishna is parajalapa. Prabhuji explained how Sri Sanatana Goswami would often go to villages and talk to brajawasis and ask them about their health, how did the crops do and their general well being. The brajawasis too considered Sri Sanatana Goswami as their Guru because his inspiration brought them more close to Krishna. So such talk may sound mundane but it was not mundane talk. Prabhuji gave some examples and stated that we should not behave like a crazy person at home – saying that I won’t talk anything else other than Krishna or don’t talk prajalpa with me to our family members, and we should be level headed. Level headed means that we behave according to time, place and circumstance. That means we ask children how are they doing in their studies, we ask well being of our family members, we help in all the daily chores of the home, etc. That is what Lord Caitanya told Raghunath Das Goswami that You manage your business externally, meditate on Krishna internally. That means externally we should look like a ‘karmi’ a materialistic person, speaking, behaving with our friends and relatives for the sake of pleasing them but internally we should meditate on Krishna. So we can do general talking with our friends and relatives and that may be considered all right but in the name of being practical a devotee should not go the extreme of becoming completely materialistic. Srimad Bhagavatam is very strict on not using our senses for mundane things and Prabhuji quoted some very strong verses from Bhagavatam in this regard. Prabhuji spoke how these days people want to speak every topic under the sun except spiritual topics. Prabhuji said that we are living in the times of media madness where so much global gossip through internet, TV, radio, all this is going on. So while living in the material world we should not develop tendency to do prajalpa with friends and relatives but at the same times among devotees we should know how to speak according to time, place and circumstances. Prabhuji said we can talk directly about Krishna, we can speak indirectly about Krishna (temple management issues, etc.) but there should not be any useless talk. Prabhuji said that prajalpa is a very important topic because our tongue and mind are connected. The tongue has two activities, eating and speaking, so we should only eat prasadam and speak only glories of Krishna. And because tongue and mind are connected so if we speak about Krishna our mind gets filled with remembrance of Krishna. Similarly if we speak nonsense with tongue then the mind gets filled with nonsense. That is why we should try to speak about glories of Krishna, pastimes of Prabhupada, share with others what we have learned, etc. instead of using the tongue to vibrate useless things like gossip. It was then the turn of HG Chaitanya Charan Prabhuji to speak. Gossip is culturally glamourised. General knowledge about things which are absolutely irrelevant to people is glamourised today. There is a term called information junkie, it defines a person who knows a lot of junk information. Much of the information we acquire is useless but because of the social standards which are there, whenever there is a discussion between some people everybody basically wants to show of how `aware’ I am of current situations. So there is a culture of glamourisation of knowledge that is irrelevant if not harmful. That comes because everyone starts thinking that this is very good as I know so much. Intellectually rationalised. This means that a person starts thinking that this knowledge must be useful for me. There are so many things I need to know. In the past the knowledge was primarily for action and application. People would learn about farming, how do you dig, how do you plough, etc. So knowledge was always connected with its utility, its functionality. Never before in the history of humanity people had so much information about which there was no action to be done. Say we say how many daughter so and so film star has, how does this matter to anyone ! When we acquire so much knowledge not only does it swamp our mind but it also makes us feel helpless. E.g. a bomb exploded in Iraq or an American ambassador was killed in Africa or there was a hurricane in America. Now if we think how much information we read in daily newspapers is going to change what we are going to do on that day, or the next day or the next month, very little. So all the information we acquire its utility for us is near zero. But somehow oh, you should be aware of current affairs.' Prabhuji said certainly we should not be completely ignorant of the things, but is not that everything which happens everywhere, we need to keep abreast of it. So its intellectually rationalised oh! I have to be up to date, specially where general knowledge is just generaltrivial’ knowledge. Technologically facilitated. Even 100 to 150 years ago news would travel at the speed of the fastest transport available. But from the invention of the telegraph onwards the availability of irrelevant news has increased so much that now, because of the internet, within moments we get information from every corner of the world. So what does this news do ? Sociologist say that news in nothing new, it’s the same old things are happening to new people !! What are things that happen in this world ? There is birth, old age, disease, death, someone loses, someone wins, someone has some happiness and someone has some distress, its the same old thing happening to new people and we call that news. Actually there is nothing new about the news. But because news from everything is so easily available that our tendency for prajalpa becomes technologically facilitated. One last consequence of this information bombardment ? As we said that when we are living in a society where information to action ratio is so low, we have so much information and so little action, and the consequence of this carries over into our spiritual life where we also want to acquire a lot of information but we don’t do any action about what we already know ! So we go on- what is said in this book, what is said in that book, what is said in that book. Prabhuji narrated an incident when HH Jayadvaita Maharaj was once asked a question. He was asked 3-4 things, what does this, this and this things mean ? Maharaj replied `that’s not a question that’s a quiz, next questions please !’ Prabhuji added, sure, we can be philosophically inquisitive and learn information but the point is here that often because of our infatuation with information we forget the application of the part and we just think that spirituality is about acquiring more and more information. And over the period of time we will start feeling oh! there is no new information available in Krishna consciousness philosophy, whatever information is there, I know about it. And then we will start getting bored. But the boredom in because there is no newness. The information is for action, the action is developing a relationship with Krishna. So when we use the information in Krishna consciousness for developing a relationship with Krishna, the newness in Krishna consciousness will come not from the newness of the information but from the newness about our connection with Krishna. As we deepen our relationship with Krishna we are able to connect with Him deeper and deeper. And that will bring newness in our life. HG Radhesyam Prabhuji later narrated how as recent as in Lord Chaitanaya’s time, devotees would talk only about Krishna while doing general things like plucking flowers, etc but. now it is just mundane talk, cricket scores, office gossip, basically awakening the material emotions of people instead of awakening their spiritual emotions. Chaitanya Charan Prabhuji cautioned that in the name of avoiding prajalpa we should not become insensitive, we must follow general society courtesies and greetings. We should not get into unnecessary mundane discussions or gossips. What is to be given up is that information which is not relevant to our immediate material life, job, etc. or to Krishna consciousness. HG Radheshyam Prabhuji said as devotees we should we careful about not wasting too much time debating topics on which we have no control like christian conversion or controversial topics like whether jiva fell from Vaikuntha or from Brahmjyoti, and so on. Whenever we have some doubt we should go to authority and they clarify the subject to us. By talking among fellow devotees nothing good will come out of it and one may start to have doubts in his mind mind about the whole philosophy itself. What good will come out by a discussion among two ignorant people, who do not know beyond each other’s level, will it help ? We should go to someone wise. Otherwise it is prajalpa discussing and arguing among our own selves. We should find and then go to senior devotees and sanyasis in ISKCON who know about such subject and get answer to our questions rather than indulging in such talk among ignorant people. So useless talk is just not about mundane discussions with general people but it could be among devotees also and we should avoid it. Prabhuji added that when we waste our time in gossip then we are disapproving Krishna’s statement that My devotees always chant My glories, i.e., if we claim ourselves to be a Krishna devotee. Prabhuji discussed in detail how in when Prabhupada was on this planet then in free time everyone would read Krishna book or talk about Srila Prabhupada or Krishna or discuss how to increase preaching. Later, Chaitanya Charan Prabhuji said in a lighter vein that ISKCON is like a Kalpataru, whatever we want from it we will get it. If someone comes here for money he will get money, if someone come for woman he will get woman, if someone come for power he will get power, if someone comes for prestige then in which organisation people come and offer obeisances to you! If somebody wants controversy then he will get more controversy than what is there in the material world! BUT if we want Krishna then we will get Krishna also. So all these controversial issues are there but ultimately it is up to us what do we want ? If we keep our focus clear on why I have come to Krishna consciousness then we will steer clear of all these things. There are so many intellectual misconceptions in the society, within and outside the movement also, so protecting our faith is our responsibility. Prabhuji further explained that it is not that any argument is irrefutable, all arguments are refutable. But just like when a war is going on and there is an elephant warrior from the other side and there is a foot soldier from this side. The foot soldier will get crushed. So right now we are all like foot soldiers. So if we hear someone talking about fall of Jiva or sidha pranali and if we want to learn about these things then we can go to our own elephant warrior and not try to fight that elephant warrior, we will get crushed. So generally speaking if anyone starts propagating any ideas then that person will have some sort of logic, some sort of reasoning, and we when we are discussing we will not be able to find what is the flaw in it, although there will be lot of flaws in it, just like a foot soldier can not fight with an elephant warrior. For example if we see Madhava sampradaya, they refute mayavada philosophy. So they have to know about mayavada to refute mayavada to but for first 20 years of their training they would never read any mayavadi books, they would read only refutations of mayavadi philosophy written by their acharayas, so they would be equipped for refutation but they would not be exposed directly. And after 20 years of education when they are deeply rooted, thoroughly convinced, they have understood the tactics of the false arguments, then they would study the opponent books. And then they can refute that also. So this is a time-honoured strategy. So we are not avoiding or dodging issues, we are protecting our faith so that we can become equipped to deal with issues when the need arises and if the need arises. So if we have already heard some controversy then we can go to some authority and discuss that and get the answers. But just circulating misconceptions or discussing with ignorant only weakens our faith and then it drags us down. 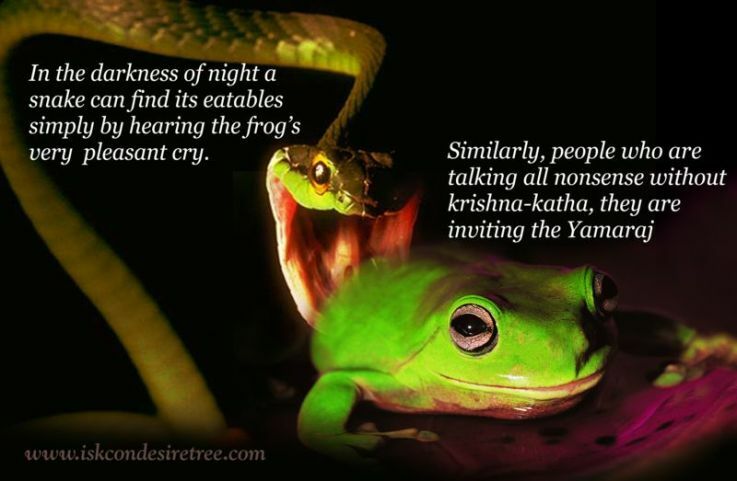 Prabhuji added that Maya attacks us in two ways, one is doubt and the other is desires. Doubts attack us at the level of our intelligence. Desires attack us at the level of our mind. So when the doubts attack us at the level of our intelligence then intelligence becomes weak and then the mind takes over. That’s how we get lost. about health of the devotees and their concerns. A good question we can ask other devotees is how do they cope up when maya attacks them. Part II of the lecture was on arguments, I am giving a very brief summary as the blog has become very long. Dry arguments are inconclusive. A great personality whose opinion does not differ from others is not considered a great sage. Simply by studying the Vedas, which are variegated, one cannot come to the right path by which religious principles are understood. The solid truth of religious principles is hidden in the heart of an unadulterated self-realized person. Prabhuji emphasised that Absolute truth can not be understood just by logic and arguments, that’s why logic is considered inconclusive. 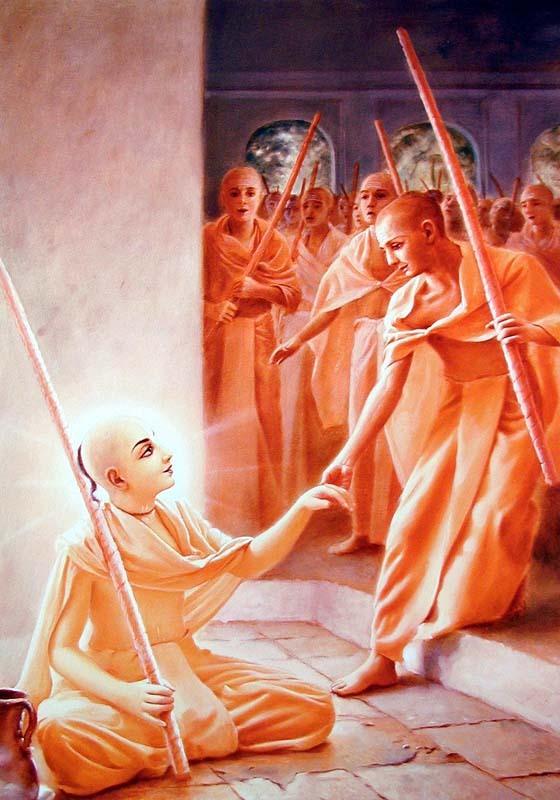 Prabhuji gave examples of how Sri Caitanya Mahāprabhu defeated Prakashananda Sarawati and later Sarvabhauma in Puri. In both the cases Mahaprabhu first entered the heart and then His opponent’s head. So at first His humility touched their hearts and then He touched their head and was able to transform their lives. Similarly we should not try to win over people by mere arguments. We should first see if the other person is open to listen to us and if not then we should see if there is any way we can open his heart and then give him the arguments. And if not then we should leave him alone and just pray for him. When we meet some other people who claim to have scriptural knowledge or they claim to know a lot, then they present something and we present something and it goes on and on and on. And if we find that this person is just not ready to learn then at that time it may be a good idea to just leave it that. Because if in the process of arguing or debating we lose our temper or become angry then that anger will further alienate that person. Either it will make him feel victorious oh I have defeated that person and makes him think he is right or it will alienate that person as he may think that these people are so narrow-minded or so self-righteous about their ideas. On the other hand if we find that things don’t work out then just end on a cordial note. We can say that you have some spiritual ideas and I have learned something else from my spiritual master. This is what my spiritual teachers have taught me is the conclusion of the vedic scriptures. Now ultimately you are a free soul and if this is what you want to believe then my best wishes are with you. And leave it that. Now at the least what has happened he has felt that devotees are gentlemanly people, they agree to disagree. Sometimes we have to leave it that. Prabhuji added that Material life teaches us in two ways one is the spiritual master, he teaches us gently, warmly, gives us instructions, and the other is the school of hard knocks, maya, beats down a person. Eventually everyone has to come to Krishna. So later on when they learn from the school of hard Knocks, when they find out that their own intellect is not solving their problems, it still keep them in illusion, then at that time if they still have positive appreciation for devotees they will come to devotees, take shelter of lotus feet of Krishna. In general people who are intellectual have lot of pride, so when they meet another intellectual person who is very humble then It charms them, they may not admit it but it charms them. Prabhuji discussed this is in detail for 15 minutes, the summary was that we should avoid it and only if necessary for practical purpose or management then we must do in private. Prabhuji also stated that few things we can understand quickly, few after some debate and discussion, few things we can understand only after years of service and realisation and then again few things we may never understand as we are finite and Lord is infinite. Also different devotees can have different definition of success. Prabhuji cautioned that gossip with devotees or non devotees takes our mind away from Krishna only for some time but debate among devotees creates aversion towards devotees and that is even more harmful. So in former case one is allured away from Krishna but in the later case we are repelled away from Krishna. So devotees should avoid such debates. Debates are useful only if they help people develop their conviction. All glories to the wonderful preachers of ISKCON. All glories to Sri Guru and Sri Gauranga. This entry was posted in ISKCON, My spiritual Journey, Srila Prabhupada and tagged arguments among devotees, association of devotees, Chaitanaya Charan Das Prabhuji lecture, Chaitanya mahaprabhu, collecting knowledge, controversial topics in ISKCON, conviction in krishna, debate for krishna consciousness, how we fell from spiritual world, humility, intelectualism in bhakti, prajalapa, Radheshyam Prabhuji lecture, sidha pranali, using intelligence in krishna consciousness. Bookmark the permalink. ← How to improve our Bhakti ? This article/blog is a eye opener for neo devotees like me. It gives nectar of devotions in the present time of kaliyug for ever lasing relation with Sri Krishna. hare Krishna prabhu ji, dandavat pranams. such a wonderful blog. clearly very instructive for me. the way you mentioned about just gathering knowledge for the sake of nothing- no action, i could relate so much with my past habit of just gathering knowledge and doing nothing with it. 1. you wrote that externally we should look like a karmi and internally we should meditate on krsna, i could understand it less. could you help me with an example on what should be my course of action in day to day life dealing with mundane topics and still meditate on krsna internally. 2.You correctly wrote on what good will come from a discussion of two ignorant persons. I find myself sometimes in this situation where i realize i should stop the discussion because i have no realizations and very little knowledge. However i only try to drive the discussion so that i can some how connect it with krsna consciousness and be able to preach to a friend/relative. what do we do in such situations where my desire is to help the other person?